Facebook makes it somewhat simple for business owners to boost posts or to launch different types of ads. They give you the option to target people by age, location, interests and more. You reach many people that could potentially be interested in what you offer, but do you achieve a return on your ad spend with Facebook marketing? What we often see, is that there is no strategy in place to achieve your marketing goals, and success or ROI from Facebook advertising isn’t measured properly in many cases. Business owners, such as yourself, are busy people and have to deal with all sorts of things on day-to-day basis. If you are time poor, it’s advisable to engage an experienced social media marketing agency to implement sophisticated Facebook advertising strategies, such as the ones suggested in this guide. However, it can be useful for business owners to know how it all works and therefore, please read on. In this step-by-step Facebook marketing guide we show you a different way, a more successful approach to Facebook advertising. This guide will show you how to generate more leads through Facebook advertising, how to measure the return on your ad spend to the dollar and how to better optimise your campaigns. To be successful with Facebook advertising you need to reach the right people, at the right time, with the right offer. Below we explain our favourite two strategies to lead generation. In both cases you need to offer something of tremendous value to the user. After all, Facebook users are primarily using the platform to entertain themselves and to connect with their friends and family. To get their attention, the offer needs wow them with something they can relate to. Let alone, if you ask for their email address the content or offer needs to be even better. If you are after quick wins, i.e drive sales or direct enquiries about a product or service, you need to be prepared to create an irresistible offer. In most cases this would be a discount of min 20-30% off or even offering something for free. You might not make much profit from this particular offer, but what’s important when it comes to creating a great offer is taking into consideration the lifetime value of a customer. Think about gyms, they always offer a free trial along with no joining fee. If someone signs up for the free trial, the gym has to make resources, i.e staff member time available to show the prospect around and to introduce them to the gym. It’s an expense for the gym, however, if the person signs up for a 6 or 12 months membership, it was well worth the effort. When creating your offer, you should look at data from existing customers and calculate the average lifetime value as best as you can. Coming back to the gym example, the average lifetime value of a member might be $840 (12 months x $70 per month membership fee). Gyms are in a very good position for that matter because their overall cost per gym member decreases with every new member. If the overall cost per member is, say $300/year, the net profit based on above lifetime value is $540/member. Even if the gym offers a discount of 30% on the 12 month gym membership fee ($840), the net profit will still be $288 for the year for a single new member. Based on average customer life-time value data, you can make a decision on how much discount you are prepared to offer or how much profit you are willing to forgo in order to acquire a new customer. Inbound marketing aims at building a segmented list and nurturing this list with drip email campaigns to stay front of mind with the prospect. It’s a fact that most people are not ready to buy from you through the first interaction with your business. According to the Online Marketing Institute’s research, on average it takes around seven to 13 touch points before a prospect becomes a client or customer of a business. It sounds daunting, I know, but in fact it’s very easy to create a multitude of touch points with your prospects, especially if you pursue a multi marketing channel approach. Our Inbound Marketing Strategy aims at building trust through engagement with a prospect and by providing valuable content. The essence of a successful Inbound Marketing strategy relies on building a segmented email list. But how do we build an email list FAST? The simple answer is, GATED ACCESS to a LEAD MAGNET. To acquire email addresses and other details we must provide valuable content or provide access to tools that help the user solve a specific problem. The lead magnet usually lives on a customised landing page and the user has to provide name and email address in a web form in order to access the lead magnet. However, in some cases a Facebook Lead Ad is sufficient. The Facebook Lead Ad type allows you to create a form within the Facebook interface. Basically, your ad states the benefits of opting-in and if the user clicks on the call-to-action button, they’re taken to a customisable form that is prefilled with their contact details. A Facebook Lead Ad is easy to set up and it makes it convenient for the user, however the space to outline the benefits of accessing your lead magnet is very limited. Once you have your landing page and lead magnet sorted, we need to have a lead nurturing strategy. What happens after we collect the email address, name, etc..? The implementation of a lead nurturing strategy requires a marketing automation tool. While Mailchimp, Campaign Monitor and other popular email tools have the functionality to set up automated email series, it’s best use an advanced CRM with marketing automation capabilities, such as Ontraport, Infusionsoft, ActiveCampaign or AgileCRM. A lead nurturing campaign needs to be planned carefully. What content can you provide to the prospect in order to engage them across multiple channels, build trust and gain more info about them to further segment the audience? In order to plan your lead nurture campaign, we recommend drawing a flowchart which shows what content will be delivered to the prospect and through which channel. Below is a simplified example of such a flowchart. We recommend adding in much more details about each step. Remember, each email should contain a call-to-action, e.g “Call us if you need help with…”, “Download this eBook”, “Sign up for our webinar”, etc.. The goal of the lead nurture campaign is a) to encourage the prospect to make contact with you, b) to find out more about your prospect and c) to stay front of mind with the prospect so that when they’re ready to engage, you’re their first choice. For example you might want to promote a new gated white paper in one of the drip emails. Instead of just asking for the email address and name again, you could ask for the phone number, website, interests and more this time. All this data can be automatically stored in your CRM if your forms are hooked up correctly. The data gained helps you create very segmented email campaigns. It takes time and requires some knowledge to set everything up marketing automation but if your strategy is successful, it can become a lead generation machine on auto-pilot. What’s better than that? Implementation of a CRM can be tricky if you have no experience and it pays off to engage an expert. We are specialised in CRM and drip campaign implementation, so please feel free to get in touch anytime and we’re happy to recommend a CRM that fits your requirements and suits your budget. One of my favourite features of having a good CRM is that you can measure the success of your online advertising to the dollar. Knowing if your Facebook campaign generates a profit helps you optimise your campaign and you can make better informed decisions. When you set up your Facebook ad, you have to provide a destination URL. This URL is the link to your landing page. In order to measure the ROI on your ad spend you need to add UTM tracking parameters to your landing page link. Google provides a very easy to use tool to generate your tracking link. All you need to do is to add your landing page URL, the campaign source (i.e Facebook, Google, LinkedIn, etc..) and your campaign name. So if someone clicks on your ad and fills out your form on the landing page, these UTM parameters are passed on to your CRM (provided you have configured your forms correctly). In your CRM within the contact’s profile you can create a custom field for each of those parameters where the data will be stored. So you’ll have a custom field for “Campaign Source”, “Campaign Medium” and “Campaign Name”. You also want to have a drop down style custom field in your CRM with various contact types, such as “Prospect”, “Customer”, “Former Customer”, etc…whatever may suit your business best. Besides that you’ll want to add the value of the customer in your CRM. Coming back to the gym membership, you want to define the 12 months membership fee the client pays your business. Ok that’s all good, but how do you find out about the return on your ad spend? The simple answer is: Apply a filter in your CRM to perform a contact search. In the filter you want to display all contacts that have the custom field “Campaign Name” set to whatever the campaign name is. For example “Free Gym Trial FB”. Additionally, you want to set the filter to display only contacts who are of the contact type “Member”. Applying these two filters will show you a list of all contacts that.. Since you defined the 12 months value of the customer in your CRM, you can now calculate the overall revenue generated from this particular campaign and you’re now able to calculate your return on investment. The best option to generate leads is the ‘Conversion’ option. This option however is only available if you have set up the Facebook Pixel on your website. The Facebook Pixel is a tracking script, similar to Google Analytics. If you don’t feel comfortable installing it yourself, you might want to ask a developer or digital marketing expert to help you with it. But why should you install the FB Pixel? a) Build Advanced Custom Audiences – The Facebook Pixel allows you to build custom audiences based on website visitors. Let’s say you’ve got an accounting business and you’d like to target people interested in how to minimise CGT. Pretty sure there is a web page or a blog post on your website talking about CGT. So now that you have the Pixel script installed on your website, you can build an audience from people who previously visited the CGT web page within a defined period. 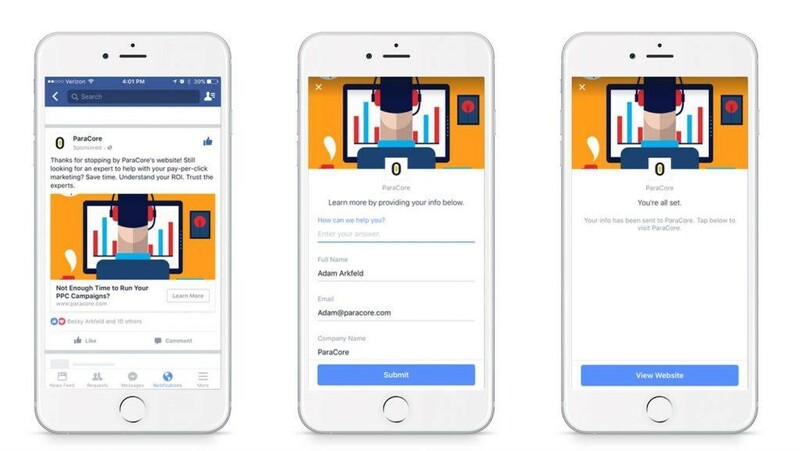 This audience can now be targeted with a Facebook Ad. In other words, we can target a very specific segment, i.e. people who have not only shown interest in your business, but a very specific service or topic. It’s called Facebook retargeting. b) Optimising for conversions – The Facebook Pixel allows you to optimise your campaign for conversions, rather than just website traffic, brand awareness, engagement or other. Why is this important? Well, as we all know Facebook is a data giant and they know pretty much everything about everyone. If we optimise for a specific conversion, such as an ecommerce purchase, the Facebook algorithm will automatically show the ad to people who are likely to purchase products online in your category. This is based off past behaviour and other insights Facebook has about its users. Having said that, Facebook states that it takes around 20 conversions for them to fully optimise your campaign. As an ecommerce store owner you might think that it takes thousands of dollars to get 20 conversions in the first place. Well it depends on what your conversion is. A conversion doesn’t have to be an online purchase. The custom conversion could be set up as ‘add to cart’ which is more likely to happen than a purchase and therefore Facebook can optimise the campaign faster and better. A custom conversion can also be setup for other actions on your website or landing page, such as accessing a lead magnet as discussed above. For example the download of a white paper could be set as the custom conversion you want to optimise for. In this case Facebook will then show your ad to people most likely to download the white paper. c) Reporting – Provided you have set up custom conversions, you will now enjoy much better reporting in your Facebook Ads manager account. Bringing up the ecommerce example again, say if you have set up a custom conversion for a purchase, you’ll then be able to see the cost per conversion, the conversion value and the return on your ad spend. A custom conversion can be set up for any action on your website which you deem important, such as a form submission, product enquiry, phone call, white paper download, etc… Depending on what conversions you have set up in your account, the data will be available in the Facebook Ads manager reporting interface. Remember, everyone on Facebook sees hundreds of ads each day or week, depending on how often they use the platform. Your competitors most likely advertise on Facebook too. A good place to start is to think about what ad copy and design would stop your audience from simply scrolling past your ad. Whether we choose the sales/discount strategy or the inbound marketing strategy as described above, the ad needs to clearly state what the benefits are of clicking the call-to-action button in your ad. The design of your Facebook ad should not contain too much text. It’s best to go by the rule, less is more. Should there be too much text in the design, Facebook automatically restricts the reach of your ad. You can upload your design here, to see if your ad is in line with the Facebook guidelines on text overlay on a design. Targeting the right audience on Facebook can make or break your campaign. Ideally your target audience is tightly-knit and as segmented as possible. Additional to the normal targeting options Facebook makes available, such as Location, Age, Gender, Interests, you can use custom audience targeting which allows you to reach a very particular audience that has already engaged with your business. There are a number of genius and sophisticated ways you can target custom audiences on Facebook. Build an audience by uploading a file containing email addresses and names. Facebook then matches these to Facebook profiles and builds an audience for you. This option is one of the best targeting options available in Facebook Ads Manager provided the email list you’ve got is segmented enough. It can be used in many ways, but certainly is a very good option to up sell and re-engage an existing client base. Retarget website visitors, i.e build an audience off people who have visited specific pages on your website and target these on Facebook with an ad. Target people who have engaged with your Facebook page, your Instagram and particular content. If you have a mobile app, you can target people who are using your app or people who took specific actions within the app. You can also create a list of people who interacted with your business in-store, by phone, or through other offline channels. Once you’ve built your custom audience from one of the options above, you can even build what’s called a Lookalike Audience. Basically Facebook analyses all sorts of attributes, interests and demographic data from your custom audience and it builds a new audience with very similar attributes. Facebook Advertising can be extremely successful if done right, but it can also be a giant waste of your time and money if you don’t know what you’re doing. While you can implement the strategies outlined in this blog yourself, it’s advisable to engage an experienced digital marketing consultant to be sure this strategy is executed in the most effective and efficient way. Extremely helpful information particularly the last part 🙂 I care for such indo a lot. Very superb viswual appeal on thiѕ site, I’ɗ rate it 10. Wow, wonderful blog format! How long have you been running a blog for? you made blogging glance easy. The overall look of your site is great, let alone the content!